Posted in Chickens by TempestT-37 with no comments yet. Some eggs in the incubator. 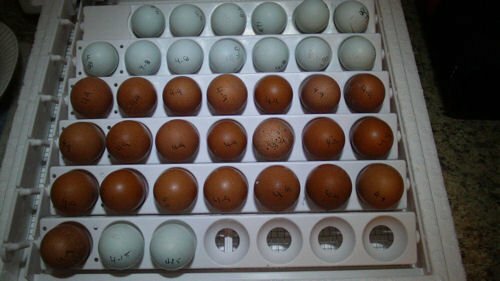 The blue eggs are from my Blue/black/Splash Ameraucana and the dark brown are from Wellsummers from BYC member mikeksfamer. This is a paper i wrote for Boy scouts for the communications merit badge. It is also my story about my 4-H fair. Hi, I am going to tell you of the 2010 Jefferson County 4-H Fair. The county fair is a chance for 4-Her’s to go and show there animals like cows, dogs, pigs, sheep, goats, rabbits, and chickens. They can also show there arts and crafts like Lego structures, wood carvings, and wood burnings. They can also show foods like Preservative foods, cookies, and cakes. They can also show photos, clothing and decorated cakes. I showed Goats, rabbits, and chickens. First, to show goats you have to work with your goat for a while before the fair so that the goat is friendly to you. If you don’t work with it you will embarrass yourself when you have to drag your goat around the showing ring. I showed 3 Kiko goats, a 2 &frac12; year old mother and her 2 4 month old babies. To show the goats you have to walk them around a showing ring and then position them so the judge has a good look at them from every angle. I earned 2 purples (1st place) and two blues (2nd place). Next, to show chickens you have to make sure they are clean and bathed. I took 6 chickens this year. Two large fowl orpingtons (which are large than normal breeds), 1 bantam White faced black Spanish (which are smaller than the normal breeds), and I also took a pen of three of Orpingtons which will be judged by the size of all three birds and the cleanliness of the birds. The judge has to take the chicken out of the cage and inspect it on how well the bird displays the breed’s characteristics. I got a blue (2nd place) on my White faced black Spanish bantam. I got Red (3rd place) on my pen of three orpingtons because they were too young to spot the aspects of the orpington. I also got a red on my Blue orpington rooster because his comb was flat instead of spiky. Then I got Champion on my Black Orpington rooster out of all the large fowl chickens at the fair. There is also something called Showmanship that tests how much I know about chickens. I had to have one of my chickens with me to tell the parts of it. I earned 3rd place so I got a 3rd place medal. Finally, to show rabbits you just have to make sure the rabbit is clean and in healthy condition. The rabbits were shown by their breed. I took 4 rabbits, 1 New Zealand (which is like a meat rabbit) and 3 Mini rexes. I showed my Mini rexes first. The first two were disqualified because their ears where too long. The last one was better; it went to the final round out of all the breeds. My New Zealand also went to the final. Out of a total of 24 rabbits my New Zealand Got 2nd place or Reserve Grand Champion. My Mini Rex got champion out of the mini rexex and the other two just got white (like a participating ribbon). There was also something called a fur class where the judge judges the quality of the fur. My New Zealand got purple and my Mini Rex also got Purple. There is also something called rabbit showmanship which shows how much I know about rabbits. There is also an ID test which show how many breeds I know from just looking at a picture. There is also a Knowledge test to also show how much I know about rabbits. I got a red in showmanship, a red in the ID test, and I got Reserve Grand Champion on my Knowledge test. Overall I had a great time at the fair and working with my animals. Posted in Boy Scout, Chickens, Goat, Kiko, Livestock, Rabbit, Scouting and tagged 2010 Jefferson County Kansas 4-H Fair by Odaroloc with no comments yet. Saturday the boys and I went to a swap meet down in Overbrook Kansas. We bought a Broken Black Mini Rex Jr buck, Jacob bought a pair of White Face Black Spanish Bantams (NPIP) and Michael bought 2 Buff Orpington chicks. The swap meet was very nice, 20 to 40 vendors. There was all types of birds from finches to turkeys and many vendors had rabbits. Posted in Chickens, Rabbit by TempestT-37 with no comments yet. Saturday I filled the incubator up with our Barn Yard mix chickens eggs. Our Barn Yard mix consist of Welsummer, Black Australorp, Cuckoo Maran and Easter Egger Ameraucana hens and a Welsummer rooster.